I really, really appreciate coffee. Still not of the addict variety (though not far from that), I like espresso (or mocca coffee), the kind you make in a two-part metal miracle maker at home, in your friendly kitchen. I have a friend who occasionally stops by for coffee, and I just have to make sure to put the mocca on cca 5 minutes before comes. It tastes good, is easy to make, and you don’t even have to wash the mocca with detergent, just water (something to do with keeping the taste). Still, the procedure sometimes makes me cringe. I’m not big on complicated things in the morning. Honestly, I prefer the nearly limitless possibilities of “cowboy coffee” (or “turkish”, as we call it in Croatia). It took me a year to master the art of making this little miracle from scratch. A friend (male! And larper…) taught me how to brew it, and it was only months later that I discovered not even my mother can make it. All you need for turkish coffee is a tiny pot (džezva for the locals), some potable water, ground coffee and a source of heat. Since you can take a not-so-tiny pot, too – resulting in literally huge amounts of fresh caffeine for you and your crew – it really is no wonder that outdoor larpers all over Croatia take advantage of it every weekend. 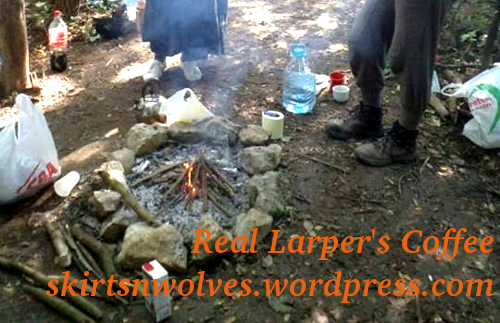 Being a larper, there’s certain things you really, really need to learn as soon as possible if you want to survive in the wilderness. One of those is how to stick your tiny pot into the outskirts of a raging fire, persuade it to boil hot enough to allow you to add a couple of teaspoons (depends on the size of the awaiting, raging crowd) of ground coffee, and remember to add enough sugar (commonly available) and/or milk (available on camps where there’s more coffee addicts). Sounds easy, right? The best online advice I’ve found so far comes from I need coffee: http://www.ineedcoffee.com/04/cowboycoffee/ I’d only add that it’s possible to stick the pot into the fire, just make sure it’s covered only partially (not in the middle of it). You need to be able to approach it with your hand, rememer? All you really have to do is remember to bring a pot (or pray someone else will – happens commonly enough), coffee, sugar and milk. Or buy it before the game, as once happened to me and my friends in Hungary – not as easy as it seems, taking into consideration that everything in the shop was in Hungarian. Not easy at all, no-no. Still, we managed somehow. For milk, don’t bother bringing anything bigger than half a litre – but, as always, it depends on the size of the crowd. And there’s no need (once more) to complicate things with one-bag 2in1 sweet excuses for coffee. Larpers need coffee. And we need it strong. Chronicles of Demgard (Hungary, pictured above by Vanchidel) – Awful, cheap, but nevertheless lifesaving Macedonian stuff. With sugar cubes. I’ll never again go to a larp camp without sugar cubes! Practical beyond words. Also, everyone loves the mere sight of them (cute as hell). Terra Nova (Croatia) – Huge amounts of coffee made by the hostess! (And I really mean huge.) Also, pancakes when there’s a stove nearby.